I'm still grooving on Kat Kerr's videos and meditating on the things she says in them. I have read some criticisms of her messages and they strike me as being nit-picking petty, as well as showing an ignorance of the Word. Oh, yes, they do quote Scripture that seems to bear out their criticisms, but they ignore other verses that support what Kat has been saying, or they just don't know the Bible as well as they think they do. Some of the criticisms are legitimate, but that does not mean that a person should reject Kat's whole message. Nobody is perfect and nobody has all their doctrine correct. Unless a person is obviously a fake (and I don't think that Kat is), we should appreciate what God has given to them to share, and spit out the bones. Kat's messages have helped to lift my eyes more to the Lord, and not be so focussed on what is happening in the world. Jesus said to fear not, for He has overcome the world. Kat's messages are very encouraging in that regard. They inspire me to keep on believing for great things, because we have a great God. As for what she tells us about Heaven, I think it is very helpful for Christians to realize that, though God is holy, He is also fun. He can be both. Preparing fun stuff for His kids is not unholy. I think it is easier to serve God when we realize that He is fun. Far too many have been raised with an image of God where He is portrayed as severe and grim, and it has kept them from receiving more of His blessings because people who see God that way tend to be performance driven and reliant on their own works to gain merit with God. Certainly, we should be obedient to the Lord and do many good works, but our service should proceed out of gratitude and joy, rather than from fear, for whatever is not of faith is sin, and it is the joy of the Lord that is our strength. When I hear about the good things that God has prepared in Heaven for those who love Him, it helps make me want to be faithful to Him, so that I don't miss out on that fun stuff, besides not wanting to be separated from Jesus forever. I keep in mind, though, that Jesus is the best part of Heaven, and wherever He is, it is Heaven to just be with Him. Just to hear His voice, not even seeing His face, would be all the Heaven a person would need to be content forever, but it sure is lovely to hear of how God manifests His love to His children when they get to Heaven. What is the matter with those sourpusses who just want to gripe about what Kat has shared? Methinks that there is some jealousy involved that God chose to show these things to her, rather than give those experiences and that message to them. Someone has strung together Kat's messages and uploaded them to YouTube, so that we can listen to them for SEVEN HOURS or EIGHT HOURS. I like to put her long videos on when I go to bed, and fall asleep listening to those lovely stories. I have also played them while doing housework. It's handy to not have to run over to my computer and put another video on when the first one runs out, and it is also a good idea to listen to the whole thing while awake before playing them while asleep, so that you can think about what she is saying and check it out against what the Bible says. The Bible doesn't say anything about rollercoasters being in Heaven, and most of the other stuff that Kat describes, but the Bible does give us insight into God's nature, and there isn't anything that I've heard her say that is contrary to God's nature. Besides that, though I believe that those things exist in Heaven in a literal way, I also see how they are metaphors for faith. Life is like a rollercoaster, and the more we trust God, the more we can enjoy it. When things seem to go awry, the Bible tells us to REJOICE. That's because, when we obey God by giving thanks in EVERYTHING, we give God's angels the signal to turn things around for us and work them together for our good. The more we move into that mindset and activity, the more we realize that, by picking on us, satan has been tricked into getting a whuppin'. The ambusher is going to be ambushed. How fun is that? Lots! It means that we're going to take spoil for the Kingdom of God. The situation is going to turn into a witness that will cause souls to be saved. We might not see that fruit right away, but it will come. It can be really scarey to move higher and higher up a rollercoaster, because that means that there is going to be a huge drop afterwards. How many have sabotaged their success on their way to reaching their goals because they are afraid of success? They are afraid that they will not be able to maintain their success when they reach their goal, and then it will be humiliating afterwards to lose it. Or, if they reach a peak of success, they will become a target for jealous people who will defame them and seek to undermine them in other ways. If a person trusts God and gives their reputation into His hands, and trusts Him to go to bat for them when they are targetted for destruction, and relies on Him for their strength to do whatever they are supposed to do, the ride can be fun. I used to have recurring dreams about marrying a certain man, one I had not yet met, who was really fabulous, and we adopted two baby girls. It was good for me to see that man in my dreams because I thought to myself, "If I am going to marry that wonderful man, then I have to be the kind of woman that a man like that would want to marry." It helped to improve my character. My daughter got pregnant when she was sixteen, and I got to thinking that maybe this man and I would adopt that baby, because Heather was also in those dreams. In one of them, she was the nanny for the two baby girls. Because of this, I was utterly convinced that my daughter was carrying a girl child. It turned out to be a boy. I was astounded when I heard that on the answering machine the day he was born. It put me in a crisis of faith. The man of my dreams still had not come along, yet. Would I ever meet him, if I accepted this boy child? There was no boy child in those dreams. Was my daughter supposed to put him up for adoption? That thought smote my heart. Even if the child got the best parents in the world, he would still struggle with rejection as he wondered why his mother had not wanted him. He would wonder about her family and why they had not helped raise him. Heather needed me to be supportive of her decision to keep her baby, and if he were to become ill, he needed me to sincerely pray for his healing, rather than to just make some lame attempt to pray for it, while still hoping for those dreams to be fulfilled. I had to make a decision between that little boy and the fabulous man I had dreamed about. I thought to myself, "Is this what the speakers I have heard were talking about when they spoke of the death of a vision?" My vision had to die, in order for my grandson to live. I thought to myself, "I must have misunderstood my dreams, because God knew all along that this child was going to be a boy. He planned for this child to be a boy. Am I being disloyal to God to let go of my faith for these dreams to be fulfilled?" Whatever. One thing I knew for sure was that God would not want me to wish for anyone to be dead, not even if they were evil, never mind this innocent, little baby. I chose to let go of my dreams and embrace my grandson. Jesus spoke to my heart and said, "This is death, but it also life. Lanny, that little boy will give you more joy than you ever dreamed of!" I still felt numb and in shock, but I as I turned to ascend the stairs to my room, after having heard that my daughter had just given birth to a boy, and after making my decision about accepting my grandson, I saw Jesus in my spirit. His arms were outstretched, and there was a big grin on His face, as He said, "Fall into my arms, little lamb." He was like a father who waits at the bottom of a slide, to catch His little toddler child. The slide was meant to be fun, not scary. The child knows their father is waiting for them at the bottom, to catch them so that they don't get hurt, and that frees them to enjoy the downhill ride. When I saw that grin and His arms outstretched, I knew that Jesus had planned, through this child, something better for me than being married to that man I saw in my dreams. The dream was a scaffold, to help launch me into developing more character, and also like a scaffold to paint a house. When the rocket has been launched, the scaffold falls away; when the house has been painted, the scaffold is dismantled. That doesn't mean that I have perfect character; I've still a long ways to go, but the stage that God had planned for me to reach at that time in my life had been completed. I also realized that God was pleased with my decision to choose love over faith. After all, 1 Corinthians 13 says that, if we have faith that can move mountains, but don't have love, it profits us nothing. When my grandson was born, he was sent off to intensive care for observation because the nurse thought he smelled odd. She supposed that there might have been a leakage of amniotic fluid when he was in the womb that would somehow affect him adversely. When I saw him a couple of hours later, and joyfully held him in my arms, I smelled only the wonderful smell of a newborn baby and remarked to the attending nurse that I didn't think he smelled odd. She said, "I don't either. I don't know why they sent him in here." Afterwards, I realized what had given him the odd smell. It was a spirit of rejection that had come on him because I had been so set on him being a girl, but that spirit dropped off of him when I accepted that he was a boy. It turned out that Connor was a delightfully funny baby who made me laugh more in the first six months of his life than in the previous eleven years, though I was by no means a gloomy person during that time, in spite of its challenges. At that point, he had already brought me more joy than I ever dreamed of. As soon as he started to crawl, he became tough work. Heather and I really had to stay on top of things to keep him out of trouble. When he was only seven months old, he was able to crawl up stairs, and he would snoop. Boy, was he snoopy. His personality type is very curious about things, and I've read that it is almost impossible for those kind of people to resist pushing an unlabelled button to see what will happen. But even though he got into a lot of mischief that freaked his mother out at the time, he gave us a lot of stories to recount and laugh about later. My Connor is also very strong–willed, and that's not easy to deal with. I helped Heather with him a lot, but things reached a point where neither of us could handle him. There is only so much you can do with a kid, if they won't cooperate. Still, he cooperated more with us than what his mother cooperated with me when she was his age at any given time, so I give him that. He had to go into fostercare, and just when it looked like everybody had reached the end of the line with him, he has delighted me by showing some initiative about learning new skills and getting work experience at only fourteen years of age. I'm so proud of him! And I am relieved that he is learning how to work and earn a living. Raising Connor has been like surfing. We had to paddle out to catch the wave. That was Heather making the decision to keep the baby and my decision to be supportive of her decision. It was tricky to stay on board that kid because, from the time he was six months old, he wanted to do what the big kids were doing, and then his ambitions quickly leaped forward to emulate adults, as well. When he was one and a half, it was amusing to watch him take a nail, a hammer, and a board, and then sit there in the garage with a puzzled look on his face, trying to figure out how they went together, because he had seen me using those things. Another time, when Connor was that age, I was sitting in the garage with one of Heather's boyfriends, chatting to him, while our fat, beloved, little baby wandered around in his diaper. Then Ante spoke up and said, "Connor, you come back here with that lighter." While we were distracted, Connor had quietly picked up Ante's lighter and a chunk of wood, and was heading into the house to find some privacy where he could "experiment." By the time he was two, Connor wanted to explore the world on his own. He had no notion of the trouble he could get into. I was so glad that I lived downstairs from my daughter when Connor was three, so that I could keep an ear open for him leaving the house on his own. He managed to do it one time, before I moved in. There was a whole room full of people, but he managed to silently crawl away out of the sliding door onto the patio, down the stairs, and up the street before they realized he was missing. Yes, it is a relief to me that now he's a big boy, nearly six feet tall, and knows more about the world's dangers, though he doesn't know everything and would do well to listen to those who have more information about that. God reminds me, though, that He has been looking after Connor all along. I wasn't around when Connor got trapped under an automatic garage door when he was seven, but God saved his life by bringing a neighbour along only a few seconds later. I wasn't around when Connor nearly slipped off the monkey bars at school and would have gotten badly hurt, if he had fallen, but he felt an unseen hand push his forehead back to prevent him from knocking it on the bars, and he was able to steady himself. There is only so much that we can do for those we love, if they won't cooperate so that we can do more, and then we have to just pray and trust the Lord. Connor has always wanted to be the boss of his own life. That is what the tug of war has been about between him and his Mom and him and me, and it figures that he would be well on his way to doing that early in life. When he finds out that he needs help, Jesus is only a prayer away. Regardless of what he says he currently believes, I put a lot of the Word into him from the time he was little and he knows what to do when he comes to the end of his own devices. Kat says that there is surfing in Heaven and this grandson of mine has been like surfing, as I have said, and as a roller coaster. It has been fun and it has been scary, with all the worry about him, but the more I trust the Lord, the less I worry about him. In Heaven, there won't be any more trials, but we won't stop learning how to trust God more and more. That is where the surfing and the roller coasters come in. Even if we go flying off our surf boards in those waves of glory, or when the roller coaster leaves its tracks and takes a leap across to another set of tracks, we will be experiencing trusting the Lord. I believe that God means for life here on Earth to be fun for His redeemed. That doesn't mean that we won't ever have to deal with unpleasant things. Jesus said that we would suffer persecution for His Name's sake, but Paul said to "count it all joy." And there are times when we have to bite the bullet and do what is right, even if we don't have any enthusiasm for what God has told us to do, but the more we see things from His perspective, and are filled with more of His love for others, the less problem we will have with lack of enthusiasm. I was also blessed to find a video on YouTube where a young man reads aloud Anna Rountree's book THE HEAVENS OPENED. Anna is another person to whom God has revealed mysteries of Heaven. Some of the things that Kat and Anna share about what they saw in Heaven sound similar to a few things that Connor shared with me in regards to dreams he had about God and Heaven and the new Earth when he was a little boy. I like to listen to Anna's book when I go to bed. It is like having my Heavenly Father read a bedtime story to me, which is something I missed out on with my earthly father and stepfather. Kat's descriptions of the beauty of Heaven and the wonderful things God has prepared for us there inspired me to do more in regards to my little habitation. I've lived in this bachelor suite for eleven years because the rent is so cheap. At times, I have been frustrated with the lack of space, but that eventually led to giving away some things that I really didn't need. And hard times helped me appreciate more that I have a roof over my head, regardless of the small size of my place. But I really wanted to have a bedroom that was separate, to give me more of a sense of seclusion and retirement. I have always loved rich colours. My Mom didn't approve of my taste when I was a little girl, but she could never separate me from my love of colour. She eventually gave me more leeway about choosing my clothes by the time I was twelve, but I could tell from the look on her face that it took a lot of effort to not say anything when I chose colours like turquoise and purple, but she figured that they were preferable to fluorescent orange. 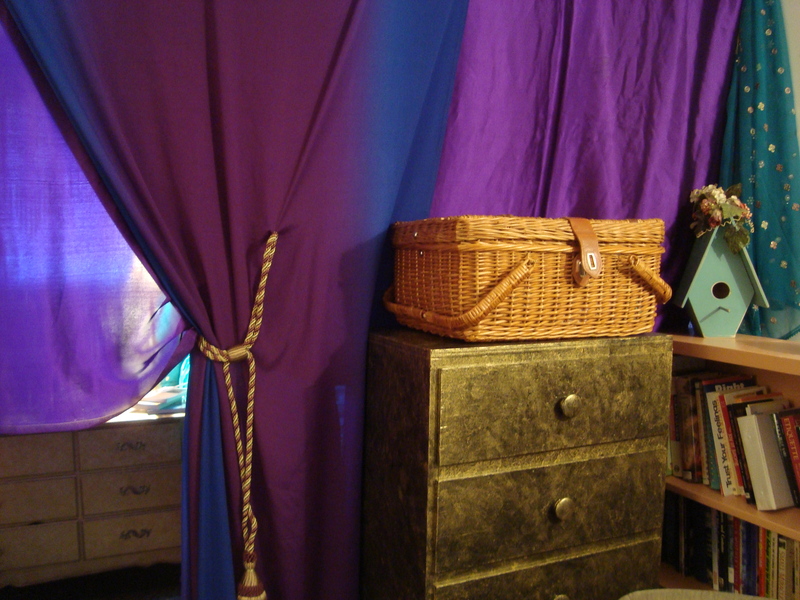 I indulged my love of jewel colours in decorating my bedchamber. A few months ago, I moved some shelves around to make a wall that sectioned off that area. After listening to Kat, and thinking about how God is building a home for me in Heaven that suits my personality, I went out and got some fabulous bargains at local thrift shops to decorate with. 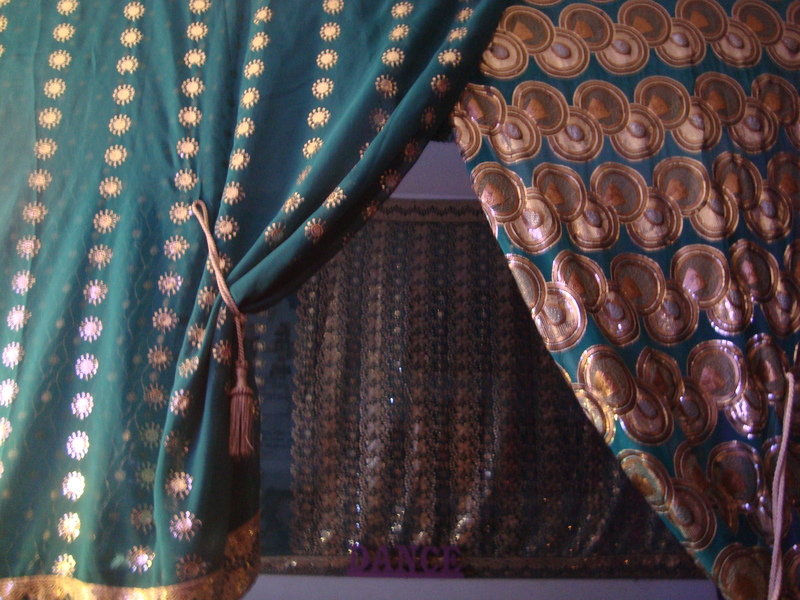 I have swagged green and purple saris around my bed, the green ones all a glitter with gold sequins. Yay! 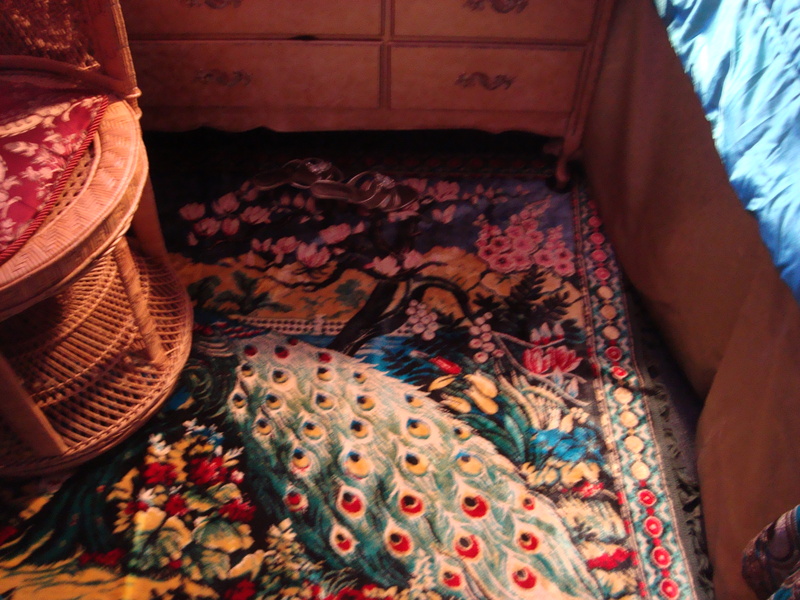 One of them has a fabulous peacock pattern on it, and I have a wicker peacock chair next to my French Provincial dresser that I sponge painted gold. I also bought some gold curtains for $11.00 each, which I have used as a duster around the bottom of my bed and the other one sections off a storage area on the other side of the bedroom space. 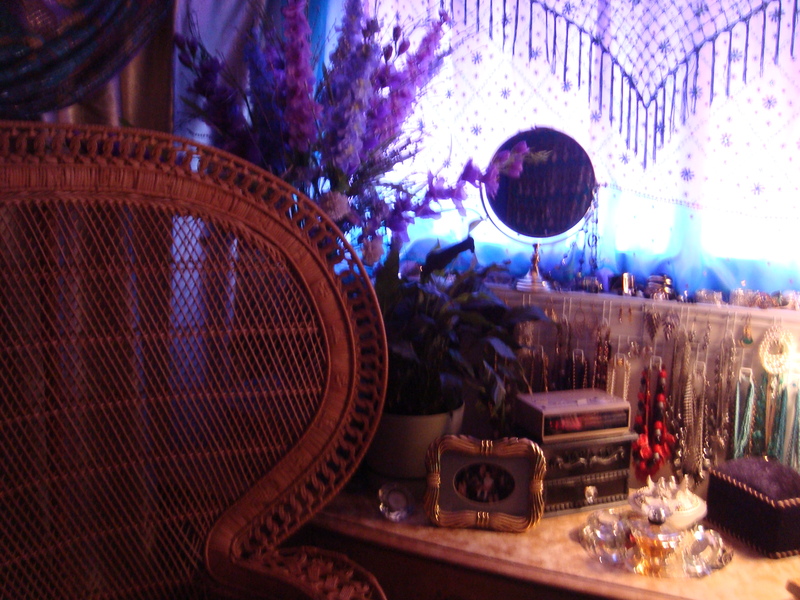 It was so much fun to redecorate in this fast, easy, and inexpensive manner, and to be pleased with the results. I dropped in on Arne after shopping on Friday, because he phoned me the day before and said he was having trouble getting into his email. It turned out that another of his former secretaries visited him half an hour before I got there, and straightened it out for him, but I showed him how to get into his email from the computer I use when I do stuff for him, as a backup plan when he has problems with his email on the computer that he uses. Most of the stuff that needed to be done to transfer Prayer Canada to the new Director in Ontario has been completed, but Arne thinks he might still call on me to work for him a few hours here and there, to help him with his own stuff, besides advertising the events that he organizes for Prayer Canada on the West Coast. He is some guy; 95 years old and only semi–retired. In addition to learning how to use a computer, Arne is also learning to cook. I did some cooking for him, when his wife was in the hospital and after she died. He remarked one day that I like to cook, but I set him straight about that. When I've had meals with him since then, he has done most of the cooking. He likes to have company when he eats his meals. I wasn't hungry, but I sat down to dinner with him on Friday and nibbled on some lettuce and canteloupe. Our friend Trish joined us, after she finished mowing his lawn. It was nice to see her again, too. Trish is a very kind lady who used to live in the neighbourhood and walked up to Arne one day, and offered to help him with yardwork. Trish charges less than her normal rates, so that Arne's veteran's benefits can cover the expense. Some things she doesn't charge him for at all, because Arne and Kathie have been like parents to her. I was blessed that she said she had missed me, since I stopped working there full–time, and because of this, one evening she wrapped around herself the wool shawl that I gave her for her birthday, so she could feel like I was giving her a hug. I was so glad to get to give her a hug for real. It's so nice to be missed. Arne misses Kathie as his companion, and he misses her cooking, so that Friday, he made rhubarb crumble from scratch. He may have trouble walking, but his mind is pretty sharp for his age. Arne recently returned from an Alaskan cruise and said that he played thirty games of checkers with a family from upcountry, and won 29 of the games. He said he would have won them all, except he got distracted watching some other players nearby. I had a bit of an adventure when I had a nap recently. A weird one. A demon attacked me. It has been a long time since I've been attacked that way. It was on my left side, trying to drag me off to Hell, and I fought it every way that I could manage, including clawing at it with my hand. That was getting me nowhere, so I said, "I have no strength of my own, but I have Jesus who strengthens me." When I said that, my fingernails grew out like swords, which did some serious damage and made that thing let go and flee away. It is good to humbly acknowledge our complete helplessness in our flesh and our need for the power of God in our fight against evil. When I was fighting it, I could feel that it was scared of failing to accomplish its mission, because it was gong to be punished, if it failed. Haw haw! It makes me want to make sure, though, that I stay faithful to the Lord and don't end up going to Hell, where there are demons who would love to punish me for making things hard for them, but God is able to keep us from falling and present us faultless before the presence of His glory with exceeding joy! To the only wise God, our Saviour, be glory and majesty, dominion and power, both now and forever, Amen! [Jude 1:24 – 25] And anyway, I hope to give Hell a lot more trouble before I'm done. May is always a lovely month, if for no other reason than the lilacs blooming and a lot of sunshine. It is my favourite month of the year. I'm thankful for the way God has been leading me in my life this month. It may seem like my life is proceeding at a snail's pace, but there are a lot of things going on in my heart and mind that are in preparation for things ahead. The best is yet to come!